It’s impossible to name one performance testing tool as the best of them all. That’s because every company’s needs are different. What’s perfect for one company may be completely inadequate for you. You’re just going to have to do some analysis of your own. Here are the factors you’ll need to consider when choosing the best tool for performance testing. Cost is probably the main reason you don’t already have a performance testing solution in place. The necessary software and hardware used to be so expensive that many businesses just skipped performance testing entirely. That’s no longer an issue. There are many open source performance testing tools you can use for free. 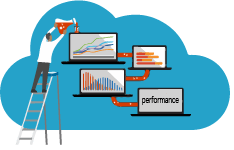 If you have some money to spend on a performance testing tool, a cloud-based SaaS solution is cost effective. With a cloud-based tool like LoadView, you only pay for the server time you actually use during a performance test. Free trial periods let you play around with a tool before making a financial commitment. As always, you get what you pay for. There is no open source performance testing tool that offers as much functionality as a premium tool. Exactly how extensive do you need your performance testing to be? If you’re performance testing a retail site that’s going to see a lot of traffic during the holiday shopping season, you’ll want to perform exhaustive performance testing. Otherwise, your company could lose customers during your busiest season. For you, a paid solution (like LoadView) is ideal. If you lack the budget, then Apache JMeter may be the next best thing. One crucial difference between premium cloud-based performance testing tools and open source tools is where the virtual traffic is created. A cloud-based solution can send virtual users to your site from all over the world. If your target market is local or regional, then this is less important. If your business is international, then this may be critical. If your site is fairly uncomplicated, then you may not need to execute complex test scripts. In that case, a less robust solution such as Siege may be enough for you. Do you want your developers to run performance testing on their code while it’s still being developed? Open source performance testing tools like Taurus or The Grinder offer than functionality. They may not be as useful for performance testing in a production environment, but can be a useful supplement to another tool. Some open source performance testing tools require coding skills. Taurus uses YAML, Locust uses Python, and The Grinder uses Jython and Clojure. Gatling uses a DSL (domain-specific language) for test scripting. If you need to record test scripts by pointing and clicking, then look to JMeter or any premium tool. Everyone’s brain works differently, so the ideal report format isn’t the same for every tester. Take a look at sample reports for each tool you’re considering. The reports are going to tell you where you have performance issues. You can’t take action if your tool’s reports don’t give you the information you need in the format you’re most comfortable with. Not liking a specific tool’s reports is reason enough to take that tool out of the running.